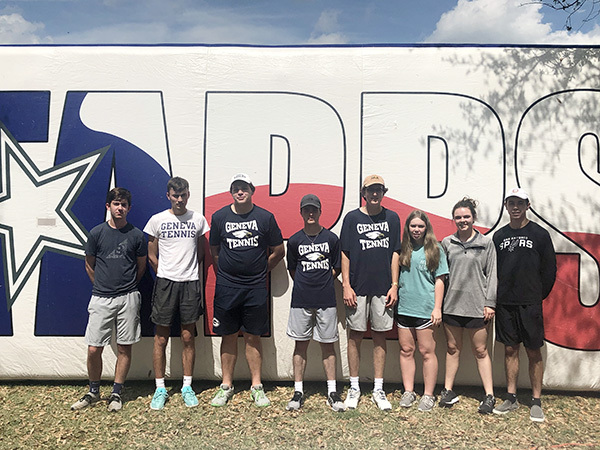 Tyler McBroom, Grant Williams, Daniel Grover, Anson Eggerss, Nathan Masso, Gracyn Freiling, Braden Hall and Nathan Young competed in the TAPPS 4A State Tennis Tourney. Several Geneva varsity tennis team members qualified to compete in the TAPPS 4A State Tennis Tournament which was held in Waco on April 8-9. The girls team qualified the doubles team of Gracyn Freiling/Braden Hall. Competing for the Eagles on the boys’ side were Anson Eggerss and Nathan Masso in singles and the doubles teams of Daniel Grover/Grant Williams and Tyler McBroom/Nathan Young. Freiling/Hall lost a close match in a third set tie breaker in the quarterfinals of girls doubles to Arlington Grace Prep. Eggerss lost in the first round of boys singles to Pasadena First Baptist and Masso also lost in the first round of the tournament to the number one seed from Tyler All Saints. The team of McBroom/Young lost their first round match and were eliminated by a team from Lubbock Trinity Christian. After winning two rounds, the team of Grover/Williams finished in third place with a loss to Midland Trinity in the semifinals. “Geneva’s eight week tennis season goes by very quickly, so the TAPPS State tournament in Waco was a fun way to close a wonderful season,” Coach Gretchen Grover said. The Eagles tennis team is coached by Gretchen Grover and assisted by Leslie Taylor. They practice at the Fair Oaks Golf and Country Club courts under the instruction of tennis pro Glenn Barton.